The Scalpel is a passive volume pedal which allows you to quickly cut the volume of your instrument to a specific level without needing to play around with a large volume pedal or using your hands to adjust the volume knob on your instrument. It also happens to be the most commonly modded pedal that we make. This custom Scalpel has two key differences from our base model (which can be purchased through our online store). Since this is being used with bass we decided to install a toggle switch to bypass the treble bleed circuit. This circuit was designed to prevent a guitar from sounding dull when turning down the volume by bleeding through some treble. 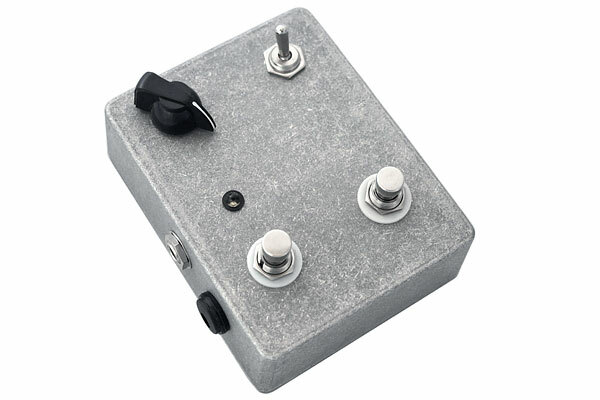 We’ve used this for years on guitar with excellent results but without having time to experiment fully with a bass we went with a toggle switch option. The other change we made was to add a momentary switch to quickly bypass the pedal for short bursts at full volume. Check out our main page (in the links above) for contact info on custom mods and view the gallery for some of our other custom creations.